How was your weekend? Mine was busy, fast but fun. I went out for dinner and drinks with some of my friends that I had not seen in a while, finally worked on a study project and spend some quality time with my boyfriend. About my look; I am really loving the flower and hawaiian prints for this season. 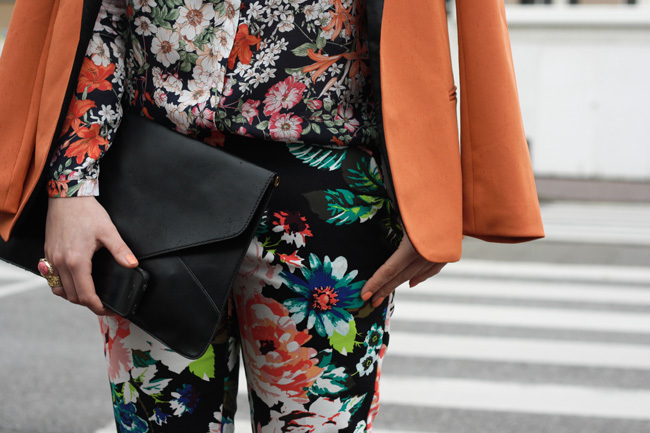 And I think it is very interesting to combine different flower prints together a la Celine. I am wearing a Zara blouse and pumps, H&M pants and necklace, clutch from Beginningboutique and a blazer from Chicwish. Btw, I am so, so looking forward to Thursday; Marni for H&M, I am completely in love with the whole collection! What are your thoughts on the collection?